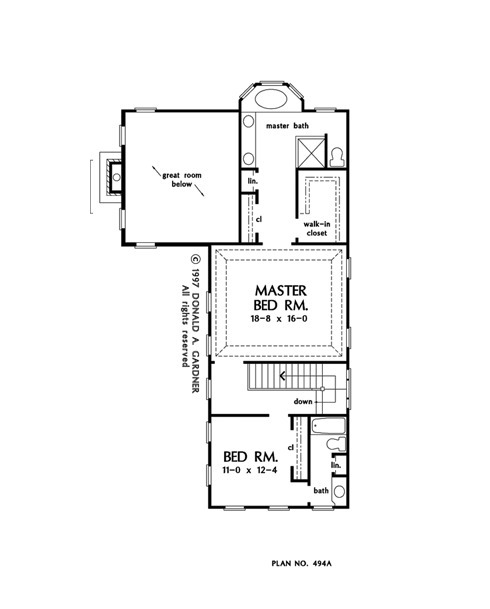 Reminiscent of the historic homes of Charleston, South Carolina, The Lancaster was designed not just with narrow lots in mind, but with style and function as well. The dramatic two-story great room opens to a roomy kitchen with angled countertop and breakfast bay. The formal dining room gains distinction from its interior columns, and the versatile first-floor bedroom/study has a walk-in closet. 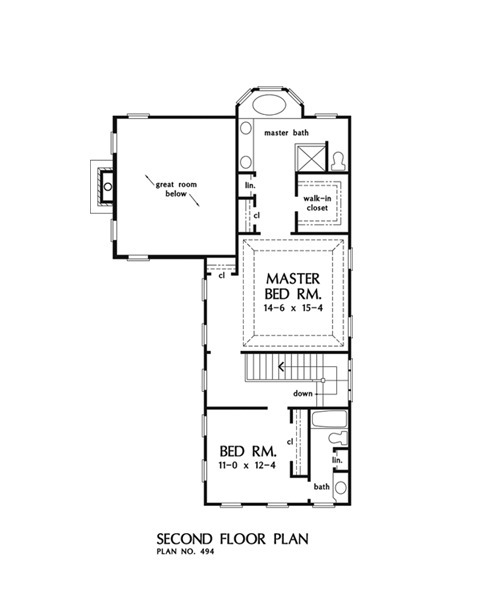 Upstairs is a master suite retreat with tray ceiling and a lavish bath with ample closet space. Across the hall is another bedroom with its own private bath and linen closet. 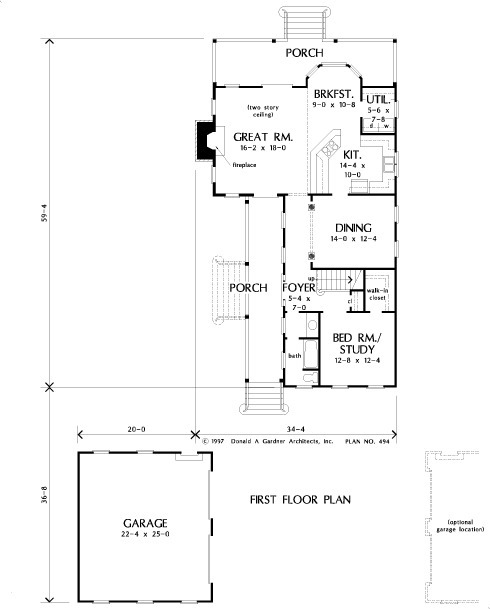 1st Floor: 1269 Sq. 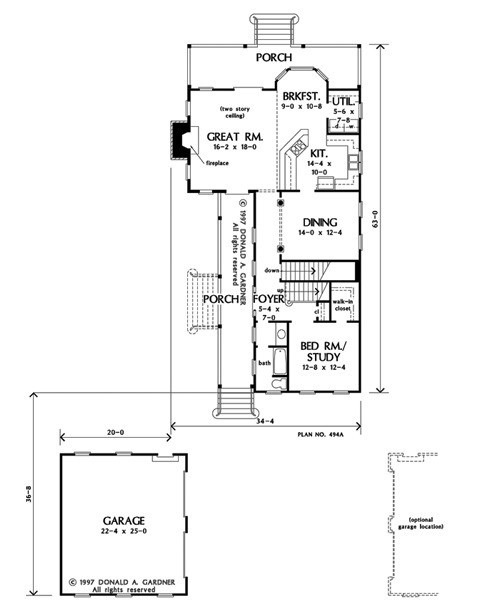 Ft.
House Dimensions: 34' 4" x 59' 4"
Great Room: 16' 2" x 18' 0"
Master Bedroom: 14' 6" x 15' 4"
Foyer : 5' 4" x 7' 0" x 9' 0"
Dining Room : 14' 0" x 12' 4" x 9' 0"
Great Room (2 Story): 16' 2" x 18' 0" x 19' 0"
Kitchen : 14' 4" x 10' 0" x 9' 0"
Breakfast Room : 9' 0" x 10' 8" x 9' 0"
Utility Room : 5' 6" x 7' 8" x 9' 0"
Garage : 22' 4" x 25' 0" x 0' 0"
Master Bedroom (Tray): 14' 6" x 15' 4" x 10' 6"
Bedroom / Study : 12' 8" x 12' 4" x 9' 0"
Bedroom #2 : 11' 0" x 12' 4" x 9' 0"
Porch - Rear : 31' 4" x 8' 0" x 0' 0"
Porch - Left : 6' 6" x 32' 6" x 0' 0"